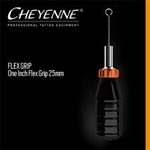 National Tattoos has a wide selection of grips, tubes, and tips to suit any artist’s preference. 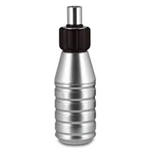 From nylon, steel, plastic and rubber grips to stainless steel tips and tubes, we can outfit your shop with the best tattoo machine parts on the market. Our rubber grips come in an array of colors for easy identification when you’re working and we also carry grip holders and tip holders to keep your space organized. Type: Cheyenne D-GRIP ERGO LONG. PRE-STERILIZED! The Cheyenne Hawk D-Grip is the first internally threaded disposable grip designed as a replacement of the aluminum grip that originally came with the Hawk Pen. This will make your machine less prone to cross contamination. The Cheyenne Hawk D-Grip sits on the end of the pen and doesn’t slide along the tube, so you can perform at your best with precision and accuracy.